Neuropathy is term that describes a damage of the nerves. Most common symptoms include: pain (often worse at night), numbness, tingling, ‘pins and needles’, burning sensation, muscle weakness and others. The damage can be caused by different conditions such as disease, infection, injury, medications, toxins or another reason. • Peripheral neuropathy affects nerves in outer (peripheral) parts of the body such as the feet, legs, hands and arms. • Proximal neuropathy affects the muscles of the hips and the shoulders. • Focal or mononeuropathy affects only one nerve. An example is carpal tunnelsyndrome. • Polyneuropathy affects several nerves. Most people with neuropathy have polyneuropathy. • Autonomic neuropathy: Nerves of the autonomic nervous system are damaged leading to symptoms such as problems with digestion, blood pressure and bladder function. • Diabetic neuropathy is caused by diabetes most commonly affects the nerves of of the hands and the feet. It can also affect nerves controlling automatic functions of the body, such as digestion, or nerves in the hips and thighs. In the UAE Diabetic Polyneuropathy is the most common type. Therefore, we will describe this type below more extensively. 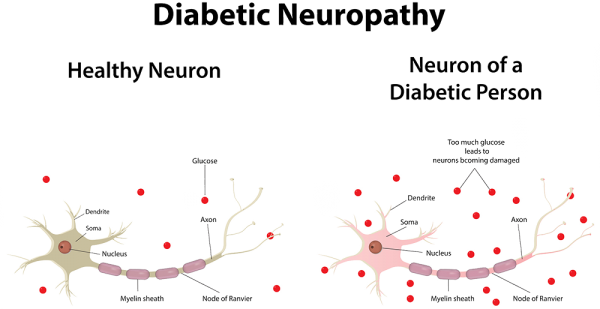 60-70% of people with diabetes are suffering from Diabetic Neuropathies. Neuropathy may be present even before diagnosing diabetes. Diabetes is the most common cause of peripheral neuropathy in the world. However, the symptoms of neuropathy are mostly unknown to the patients and difficult to diagnose. Early diagnosis is important as diabeticneuropathy can damage any nerve in the human body. Be it the nerves controlling the heart beat or the nerves of the skin. Diabetic skin lesions are the major cause of foot amputation. Diabetic Neuropathy means the affection of many nerves due to very different reasons and it can therefore develop many different symptoms. Most frequent are paraesthesia such as prickling, numbness, burning of the feet, but also palsies, disorders of speech and failure of cerebral nerves. The distinction between the different kinds of diabetic neuropathy is crucial as far as the different approaches to diagnosis and management are concerned, but also regarding the prognosis. In the long-term, by way of Diabetes and Complications Control, trial patients who controlled their diabetes meticulously showed significantly less neuropathy. When symptoms of neuropathy occur in patients suffering from diabetes or early signs of polyneuropathic painpatterns as described above, occur, an early neurological examination is of the essence. Moreover, specialized neuropathic pain treatment can easy the symptoms. Common pain killers are usually not effective enough and anticonvulsants, antidepressants and other drugs need to be used. Since more than ten years GNC is the leading clinic for Neurology in the UAE. All our Neuropathy experts are German Board Certified and have minimum professional experience of 25 years. If you are searching for the most trusted Neuropathy experts, you came to the right place.